Russian fans were pretty dejected when they heard the news on the last day of the 2006 Winter Olympics. Evgeni Plushenko, a gold medalist at the 2006 Winter Olympics and arguably the brightest star in modern figure skating, has announced he would quit the amateur sport after the Turin Games. To a certain extent, we got used to seeing great athletes end their careers sooner or later. But the wonder boy from St. Petersburg is just 23 years old. He could have skated at the Vancouver Games in 2010, and in Sochy in 2012 should Russia become the host of the 2012 Winter Olympics. 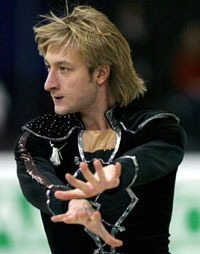 “I’m tired of skating for the benefit of the state,” said Plushenko to reporters. “I’ve won all the titles a figure skater can win. But you can’t make much money if you’re an amateur. The prize money in Grand Prix amounts to five thousand U.S. dollars only. And I have a family to support. Therefore, I’ve made a decision to join the professional sport. I will do business, I will take part in some ice shows in Russia and North America,” added he. Plushenko believes that his switching to professionals will help make his sports career much longer because the pressures in the professional world of sport are not so huge as those in the amateur sports. He estimates he will be able to participate in professional tournaments for at least seven years. “I’ve just heard about Plushenko’s decision to leave the amateur figure skating,” said Ari Zakaryan, in an interview to Komsomolskaya Pravda. “I still have no idea what his reference to ‘his own business’ was all about. But we’ve got lots of plans to carry out. We’ve received pretty interesting offers, and we’ve already got 4-5 projects that look nice for Zhenya. He’s most likely to join the professionals to invest his salaries in some kind of business enterprise. I don’t know the details. Actually, it’s none of my business,” said Zakaryan. Rumors keep circulating through the figure skating community about Plushenko’s new manager Yuri Goroshevsky who nearly ruined the figure skater’s performance at the Turin Games. An ice show by Viktor Petrenko was scheduled for December last year in Kiev. A “rival” show by Ilya Averbukh was suddenly announced in Kiev just a few days prior to the Petrenko’s opening night. Goroshevsky somehow got Plushenko fixed up to Averbukh’s show. Petrenko got angry as a result. The point is that Petrenko was to a head judge of technique and components programs performed by figure skaters at the 2006 Winter Olympics. Ari Zakaryan learned about Goroshevsky’s dealings just a few days before it was too late to mend anything. It took him a titanic effort to smooth over the conflict Plushenko and Petrenko. Plushenko ended up skating in Petrenko’s show. The show by Averbukh never opened in Kiev. Is Plushenko under his wife’s thumb? The first signs of changes Plushenko was going through became noticeable even before the display program. Persons previously unknown to anybody were beginning to keep themselves in the foreground of his team. Those people are associated with the family of Masha Yermak, Plushenko’s wife. They are said to have exerted plenty of influence on the figure skater by regularly elbowing aside Plushenko’s coach Alexei Mishin and the figure skater’s longstanding agent Ari Zakaryan. Any deals relating to ad contracts and other varieties of cash flow were controlled by one Yuri Goroshevsky who is rumored to be a friend of Masha’ s father. “Many people became keen to do business with Plushenko once they found out that he could be a real moneymaker,” said Zakaryan. “Zhenya is in great demand now. I’d be most happy to see Goroshevsky and the Yermaks helping Zhenya out. But it would be a different story if they’re only trying to capitalize on his popularity,” added he. “Cooperation between Zakaryan and Plushenko goes on,” told us Alexei Mishin reassuringly. “Zakaryan is in control of every detail that has to do with Zhenya’s shows. Goroshevsky does not interfere in the process of training and competition,” said Mishin.